The City of Edmonton hosted a public information session, where it shared the final detailed design, construction timelines and detours during construction. The City has completed archaeological pit testing on the north bank of the project area. Construction of temporary access roads needed to build river berms will begin in January 2013. The Walterdale Bridge Replacement project is now in the detailed design phase. This phase will define and detail the construction scope of the project, including final bridge design, alignment, construction lay-down areas, associated road and trail connections, utility relocations and requirements to protect cultural heritage and the environment. Approximately 180 people attended the Public Open House held on the evening of Wednesday, February 8, 2012 at the Old Timers Cabin. City representatives and members of the project team presented the overall preliminary design for the Walterdale Bridge Replacement project and were available to answer questions about the project. Below are the links to the Open House materials outlining the recommended preliminary design for the Walterdale Bridge Replacement. Three arch bridge alternatives for the new Walterdale Bridge were explored during the preliminary engineering design phase. Each of the alternatives was evaluated by a set selection criteria with Alternative 2 being the recommended option for detailed design. Construction Cost – The City of Edmonton is seeking a quality design that can be constructed at an acceptable capital cost. The project budget is $132 million. Aesthetics – The Bridge should have an aesthetically pleasing, light appearance and when viewed within the context of the river valley, the bridge should relate to the natural environment. 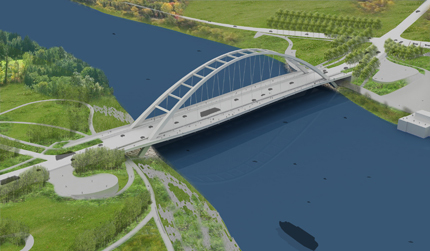 The bridge should complement the views of the Legislature Building, the High Level Bridge and other buildings on the tops of the banks. Pedestrian and Cyclist Experience – Pedestrians and cyclists should be able to cross the bridge on the sidewalk or shared use path in comfort and safety. Constructability and Schedule – The Bridge should be relatively easy to construct and the length of construction schedule should be reasonable so that the perceived construction risk to a contractor is minimized. 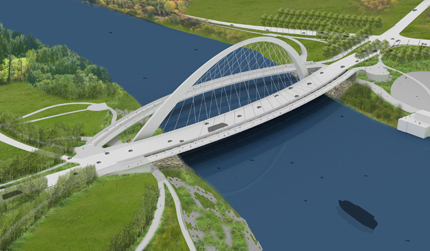 Driver Experience – Motorists should have a positive impression of the North Saskatchewan River valley and the entrance to downtown Edmonton when travelling across the bridge. Life-Cycle Cost – Total life cycle costs of the structure over a 75-year service life, including annual maintenance and major rehabilitation costs should be minimized. 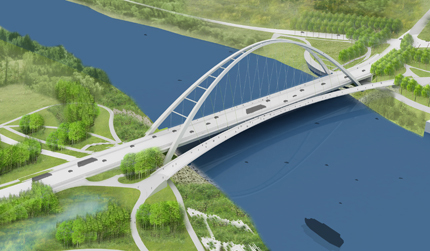 Environmental – The new Walterdale Bridge should be constructed with minimal disturbance to the environment. Traffic Accommodation – If possible, the existing bridge should remain open to accommodate traffic during the construction period. North Bank Disturbance – The impact of the construction of the Bridge replacement on the north bank should be minimized. The City of Edmonton continues to engage representatives of key stakeholder groups. On December 8, 2011 the Stakeholder Input Panel received the latest Preliminary Engineering Update. The feedback the City will receive will be considered alongside all technical data that has been gathered for the project. This phase of public involvement will continue into early 2012 and will include one on one interviews as well as a public information session. In February 2012 a public information session will be held where all interested parties can attend and provide their input. A specific date is not yet known however a meeting notice will be placed on this page and additional advertising will be used to notify residents.